Item # 312946 Stash Points: 495 (?) This is the number of points you get in The Zumiez Stash for purchasing this item. Stash points are redeemable for exclusive rewards only available to Zumiez Stash members. To redeem your points check out the rewards catalog on thestash.zumiez.com. 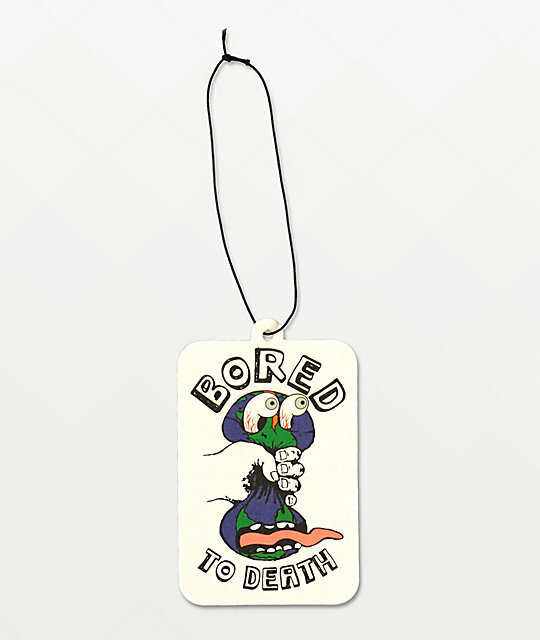 Whether your bored or not it's still nice to make your spaces smell good, so grab the Bored To Death air freshener from Teenage. This "black ice" scented air freshener displays the image of a cartoon globe being squeezed by a hand accompanied by the words "Bored to Death." Bored To Death Air Freshener from Teenage.